A smiling chef putting the finishing touches on a plated seafood meal. Shallow dof, focus on the food and the garnishing fingers. Whether you are seeking a private chef for your Cabo villa or you require staff for a corporate event, having the best efficient concierge services insures you get the most from your holiday and special event. Finding a private chef can be a great way to have authentic Mexican cuisine served in the comforts and privacy of your vacation home. Specialty diets, preferred meal choices, and other personal options are easily fulfilled with a private chef to cater your needs. 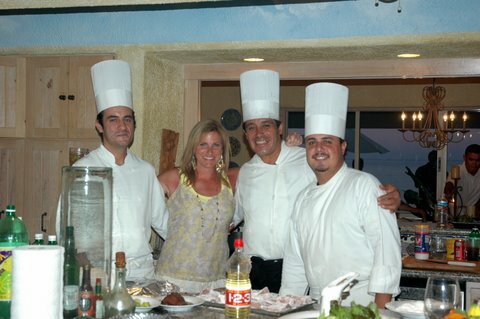 With so many qualified chefs in Cabo, you will be able to find the perfect one for your event. Let the local professional experts work for you! 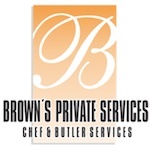 Brown’s is a private catering company that caters towards people staying in villas. Chef in Cabo is a private catering company that caters towards people staying in villas. Denni´s Catering has had experience catering in Los Cabos for over 10 years. Chef Denis Gabriel specializes in great food and quality staff services, butlers, cleaning crews, and even entertainment options. All of the assorted menu directorys are of international flair. 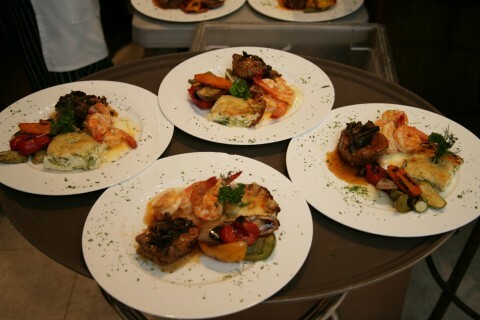 Whether you have 2,000 or 2, Denni’s catering can help you craft the most amazing meal. 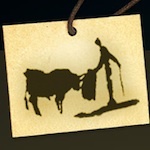 El Matador Catering was founded in Los Cabos by Pablo Velez, a bull fighter with a passion for cooking. Whether your private special event is for work or pleasure, El Matador Catering can make sure your food is delicious. With extensive catering experience in birthdays, business conventions, weddings and other events, El Matador can craft an amazing experience. Many times guests staying in private villas in Los Cabos hire private chefs to cook breakfast, lunch or elaborate dinners. This way you get can eat in the comfort of your accommodations without having to worry about preparing food. You may hire chefs for just a single dinner or for your entire stay in Cabo. Grocery stocking services are also available through caterers or concierge companies if you are staying in a vacation rental in Los Cabos. Most companies will have a list for you to choose what you want ahead of time. When you arrive in Cabo, your fridge and pantry will be filled with all of your favorite food and drinks! Whether you are planning an elaborate destination wedding or a simple business lunch meeting, there are a variety of catering options in Los Cabos. Most catering companies are also able to provide event staffing and bartenders. If you need to setup corporate events at a preferred hotel or inn, this service will guarantee perfection. All you do is make a phone call, and all the preparations are taken care of for you. When you arrive, a personal chauffeur will pick you up and take you directly to your hotel. Of course, after the meeting, allow the chauffeur to give you a personal tour of the local area. Catering private parties is easier than ever. In fact, you will host a dynamic party that will be in the memories of everyone for a lifetime. When you dream of the ultimate wedding reception, a concierge will provide the best in conveniences. Be a guest at your own party where a private chef and wait staff has been hired to deliver your specific instructions.